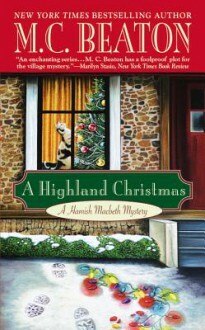 Celebrate the Holidays with M. C. Beaton, The Queen of The Cozy Mystery. In the dark, wintry highlands of Lochdubh, Scotland, where the local Calvinist element resists the secular trimmings of Christmas, the spirit of Old St. Nick is about as welcome as a flat tire on a deserted road. Nor is crime taking a holiday, as Constable Hamish Macbeth soon finds himself protecting an unhappy girl, unlocking the secrets of a frightened old woman, and retrieving some stolen holiday goods. Now the lanky lawman must use all his Highland charm and detective skills to make things right. And he had better do it quickly, for the church bells will soon toll and all of Lochdubh will be forced to face another dreary winter without the comforting embrace of Yuletide cheer.